A waterfall model is a common project management method used in software development. It’s a great option when you need to apply a sequential approach to your project plan. See how a waterfall model works by giving this free TeamGantt waterfall template a try! A waterfall model lays project tasks out in cascading intervals so work gets done one step at a time. Dev teams are especially fond of the waterfall model because it follows a strict, logical process that easily aligns with the software development life cycle (SDLC). You can build and track every phase of the SDLC process sequentially with a waterfall model—from research and discovery to testing and deployment. That way nothing falls through the cracks on your way to the finish line. Let’s take a look at an example of a software engineering project plan using a waterfall model. In this example, we’ve scoped out tasks for adding a new app feature. The phases of the SDLC process are listed down the left, with task timelines and dependencies represented on the right. 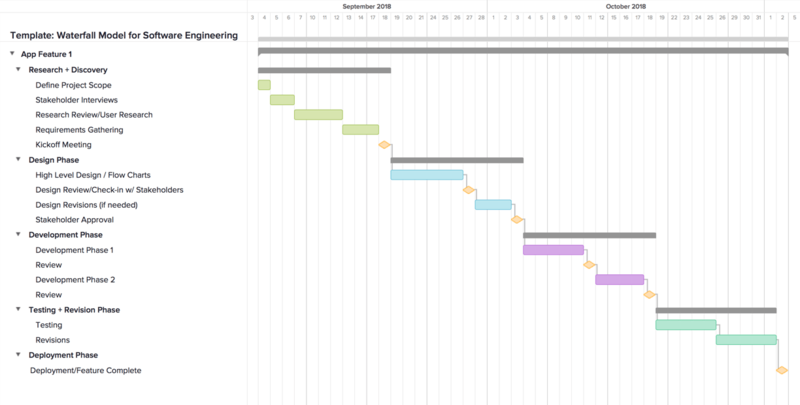 Notice how the tasks and milestones form a waterfall structure as the project progresses. When one task or milestone is complete, the next one begins. For example, deployment can’t happen until the Testing + Revision phase wraps. Ready to build a project plan using the waterfall model? We’ve given you a headstart by creating a free waterfall model template for you in TeamGantt. Customizing the template is easy-peasy, thanks to TeamGantt’s drag and drop features. And since everything’s online, your whole team can collaborate on projects in real time. 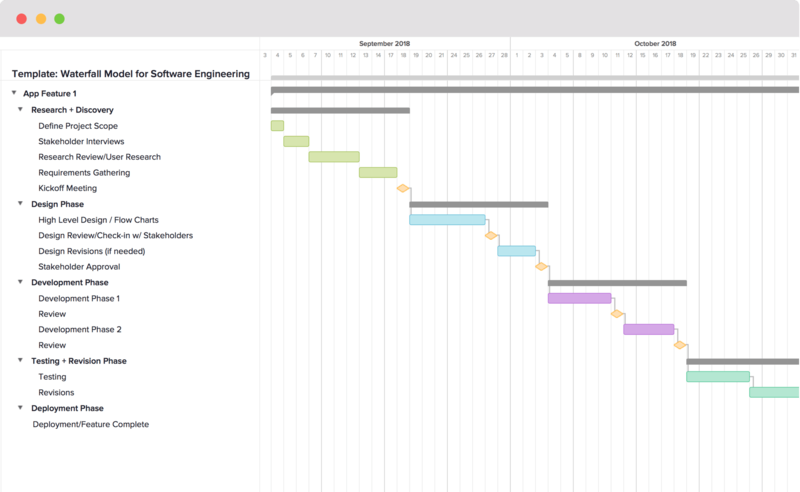 Sign up for a free TeamGantt account today, and save time on project setup with this free waterfall model template!